Biologists at LMU have identified two 168-million-year-old fossils as the oldest known parasitic representatives of the crustacean group Isopoda. The study sheds new light on the evolutionary history of isopods. Isopods -- of which the woodlouse is perhaps the best known representative -- are crustaceans, related to shrimps and lobsters. Representatives of this crustacean group exhibit a wide variety of lifestyles and exploit a large spectrum of ecological niches. Cymothoida, an isopod ingroup, is composed of different sub-groups that evolved different feeding strategies, from free-living scavengers to host-specific and obligate parasites depending on their hosts for their survival; hence, isopods in this group show an extremely diverse morphology. A new study of the oldest fossil parasitic isopods discovered to date, carried out by LMU biologists Christina Nagler and Joachim Haug, has allowed reconstructing the evolution of parasitism within Cymothoida in detail. The findings have just appeared in the online journal BMC Evolutionary Biology. For the study, the authors chose two specimens of the fossil species Urda rostrata held in the Bavarian State Collection for Paleontology and Geology in Munich, which are unusually well preserved and amenable to three-dimensional reconstruction. Both were recovered at the same site and are 168 million years old, hence from the Jurassic period (145-200 million years ago). Representatives of Urda were widespread during the Jurassic. However, little is known about their lifestyle or phylogenetic affiliation, as morphological characters that would allow drawing reliable conclusions on these aspects have not been accessible in the fossil specimens investigated so far. 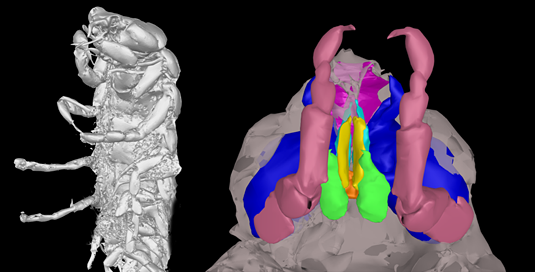 “With modern imaging techniques, especially micro-computed tomography, we were able to visualize morphological details of the mouthparts and the legs of these fossil isopods for the first time,” Nagler says. The imaging data revealed that the fossils possess certain features that are typically found in modern parasitic isopods. The morphology of the mouthparts suggests that both specimens were specialized for piercing and sucking, while the legs on the thorax end in clearly curved hooks of the sort that modern forms use to attach themselves firmly to their hosts. These aspects of its functional morphology therefore support the inference that U. rostrata was an external parasite. Moreover, both specimens were recovered from limestone beds indicative of a tropical lagoon – an environment in which diverse present-day species of Cymothoida occur as obligate ectoparasites on fish. In addition, the fossils have a number of morphological features in common with modern isopods which follow a parasitic lifestyle only during the juvenile phase of the life-cycle. “This finding indicates that the morphology of the mouthparts and the thoracic appendages was progressively adapted to the demands of a parasitic lifestyle,” Nagler explains. Furthermore, the reconstruction of the phylogenetic relationships suggests that parasitism originated only once within Cymothoida, and that the transition from scavenger to parasite involved intermediate forms that began as opportunistic predators (like mosquitoes) and subsequently gave rise to stage-specific and to obligate parasites.